Pat yourself on the back and congratulate yourself because you are doing a great job in the classroom and/or gymnasium! And you are doing it despite budget constraints, staying on top of ever-changing state and national standards, the pressure of unannounced and announced observations, the demand to differentiate your instruction to meet the needs all students, and the myriad other tasks of teaching. The Fit Kids Fit Future curriculum can help you with all those tasks, while complementing your existing curriculum with exciting new tools for your teaching toolbox. The Fit Kids Fit Future Physical Education curriculum includes an innovative testing template–the Fit and Ready Assessment–as well as a new take on daily warm-ups, kid-tested adventure games, and an engaging new leadership component. The Fit Kids Fit Future curriculum incorporates well into a sports-based program. You could teach your football unit and then do some of the adventure games and then do a volleyball unit. Or you could do the Fit Kids Fit Future warm-ups at the beginning of your Physical Education class and then teach your football, volleyball, etc…lessons. There are many ways that you can continue what you already teach while utilizing the tools from the Fit Kids toolbox as a strong supplement. You might be telling yourself “I like the warm-ups that I use already”. 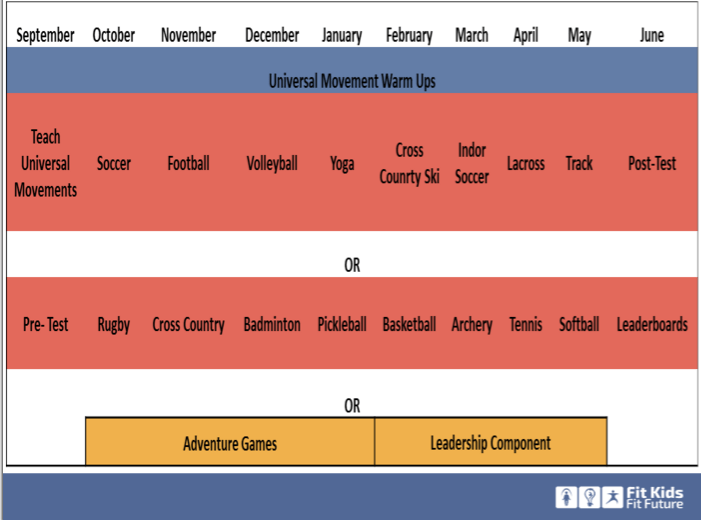 If you are already doing push-ups as part of your warm-up, you could add in the push-up progressions that are provided with the Fit Kids Fit Future curriculum that will differentiate instruction to meet all students where they are at. A student who cannot do a push-up could start with our modified version instead. During the 2014-2015 school year at Waterville school, only 24.4% of 7th graders could do a perfect push-up during the pre-test. During the post test in June, 68.8% could now do a perfect push-up, after working all year with the progression in their daily warm-ups. There are many examples of Physical Education teachers that have used the Fit Kids curriculum as a foundation for their programs and have built upon it with their own creative ideas. One teacher plays music during the Fit Kids Fit Future warm-ups, and when the music stops the students change stations. During the Leadership component, when students were creating and coaching their own games, Tammy Alcott had a legally blind student in her class who was able to create and coach her own game using a beeping ball and blindfolds with the help of the Association for the Blind & Visually Impaired. The Fit Kids Fit Future Health curriculum is comprised of three interlocking modules that lead students to take responsibility for their own health with some never-before-seen topics. In her health class, Tammy has still been able to cover her favorite topics that are not included in the health curriculum, such as her “-isms”. unit. There are several places in the curriculum where teachers could take a break or insert their own units. One of our most innovative is the Hidden Genius lesson, occurring in Module 1. Here, students identify their unique skill sets and explore how these might contribute to other human beings, to animals, or to the planet. Another is : Building an Action Plan. In this lesson, students demonstrate an understanding of the link between developing an action plan and achieving their goals. Students also write their own action plan based on their goals. So, keep doing what works well for you, but look into what Fit Kids Fit Future can offer you. 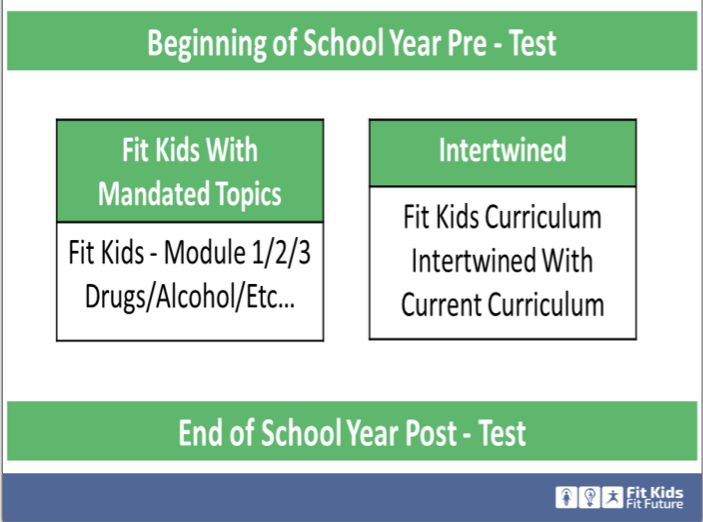 Whether you are looking for just a few innovative ideas to jazz up your classes, some help with Standards alignment and Best Practice activities for your observations, pre- and post-testing in your PE class, or a whole new paradigm, Fit Kids curricula will invigorate your teaching and add new tools to your toolbox. Send us an email at talcott@fitkidsfitfutue.com for more information!